The convenience of cashless payment transactions will be extended to 957 government health clinics nationwide via the E-payment service to facilitate payment transactions. 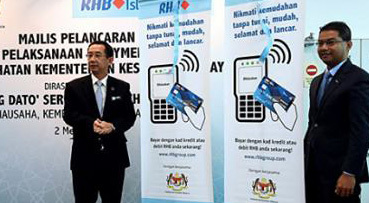 According to Dr Chen Chaw Min, the Health Ministry’s Secretary General said that the E-payment programme would be implemented in phases this May, beginning with 12 clinics in Kuala Lumpur and Putrajaya, and 45 clinics in Selangor. Speaking during the recent launch of the programme at the Kuala Lumpur Health Clinic, Chen said that currently, cash payments at registration counters are adopted at all government health clinics. “However, in line with the government’s call for Malaysia to become a ‘cashless nation’ by 2050, the ministry has taken the initiative to introduce e-payment for medical bills at the health clinics,” he said,adding that the e-payment method was already available at 115 hospitals, one district health office and four selected health institutions. The programme is being implemented in collaboration with RHB Islamic Bank Bhd.